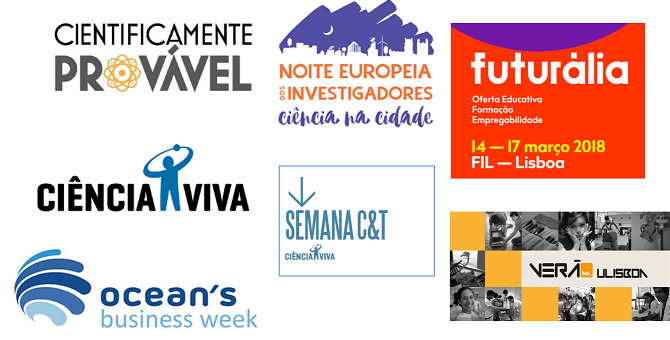 In order to promote scientific culture, particularly among the younger generation and educators, we will keep participating in outreach activities, such as the Chemical Open Labs, Cocktail de Ciências, Internships for young people in laboratories, Science&Technology Week, Futurália, Ciência Viva School and Cientificamente Provável Program. These activities can take place at CERENA, at the IST Geosciences Museums or at schools. The Geoscience Museums of the Instituto Superior Técnico (IST) – Lisbon University are located on the Mines Pavilion (Alameda Campus). The collections of these museums include, in addition to various kinds of geological materials, scientific instruments and educational materials (books, maps and historical photos), personal scientific items that belonged to various teachers of the Mine Section of DECIVIL Department. The major part of the collection comprises geological materials from Portugal and from its former colonies that came from historical mining occurrences, no longer accessible. An updated and continued study of the collection is provided by the Mineralogy and Petrology Laboratory and other national and international research teams. The Geoscience Museums encompasses two specialized museums: Alfredo Bensaúde Museum and Décio Thadeu Museum belonging to the Guide of the Portuguese Geological and Mines Sites. The initiatives associated with the guide are recreational, cultural, educational, scientific, therapeutic, and include locations such as: abandoned or working mines, museums, curiosities, natural landscapes, R&D Centers.